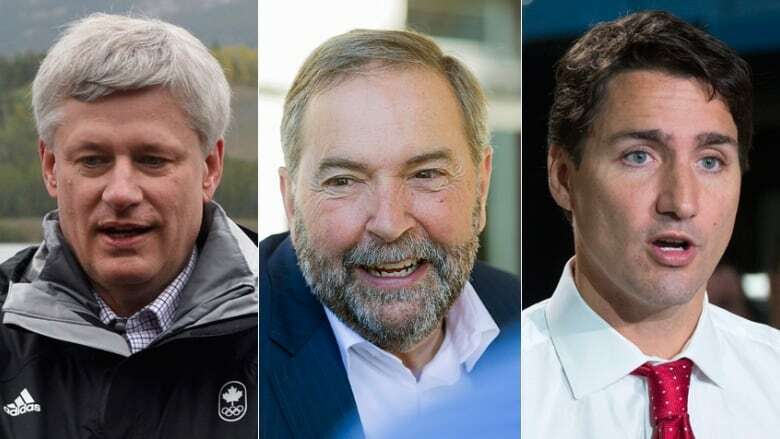 The trends are pointing toward the Liberals and away from the Conservatives as the campaign enters its second phase, but who will win remains no clearer today than it was on Aug. 2. With the Labour Day weekend now over, the federal election campaign moves into its second phase. It starts with the three major parties locked in a close race, but the longer term trends point to the Liberals coming out of the first phase with the momentum — and the Conservatives on the decline. The New Democrats still hold the lead in the CBC Poll Tracker, as they have since the start of the campaign. The party is averaging 32.4 per cent support, with the Liberals following in second at 30.2 per cent and the Conservatives at 26.9 per cent. Compared with where the averages stood on Aug. 2, when the campaign officially kicked off, this represents a drop of 0.8 percentage points for the NDP, a slide of four points for the Conservatives, and a gain of 4.6 points for the Liberals. The trend line has generally been positive for the Liberals since the start of the campaign, and that of the Conservatives negative. The New Democrats, however, have been wobbling up and down. Their lead over the second-place party has been as narrow as 1.3 percentage points and as wide as 9.3 points over the past month. The polls have also been somewhat inconsistent, at least on the face of it. Some have given the New Democrats a wide lead, others have shown the three parties clustered within the margin of error. But though the polls may be in some disagreement on the precise state of the race, they are showing broad agreement on how this campaign is unfolding. Seven pollsters have been in the field in the weeks prior to the campaign launch and during the campaign itself. Across all of these seven sets of polls, the parties are showing similar trends. The New Democrats have been posting either steady or fluctuating results, with little discernible trend in one direction or another. For the Conservatives, the polls have all been showing stagnant or negative trends, with five of the seven pollsters posting the Conservatives at lower numbers now (often significantly so) compared with where they were prior to the campaign launch. All seven pollsters have the Liberals with more support in their latest soundings than their last pre-campaign survey. A minority government, but of what hue? The polls are also all pointing toward a minority government, and with the NDP leading it has the inside track. The party is currently projected to win between 108 and 137 seats, with the average projection awarding it 122. The Liberals are now not far behind, with a projected range of between 90 and 125 seats (or 114 on average). Narrowly in the rear are the Conservatives, with between 89 and 125 seats (or 101 on average). While that suggests the NDP is the favourite to win at this stage, the performance of the polls in past elections (as reflected in the seat ranges) show that, if an election were held today, no bet on who would win would be a safe one. The changes in the seat counts since the start of the campaign align with the polls. The New Democrats have hardly budged (they were projected to win between 116 and 143 seats on Aug. 2), but the Conservative range has dropped by 23 seats, and the Liberals' has increased by about 30. The regional breakdowns show how each party's hopes are based on particular parts of the country. The New Democrats are slated to win almost half (58 to 64) of their seats in Quebec, with 20 to 25 in British Columbia and 18 to 28 in Ontario. The Liberals take half of theirs in Ontario (43 to 64), while winning 18 to 22 in Atlantic Canada and 10 to 14 in Quebec. The Conservatives are projected to win 36 to 54 seats in Ontario, 28 to 31 in Alberta, and 14 to 18 in Saskatchewan and Manitoba. If the Liberals are on the upswing and the Conservatives are on the downswing, it is primarily due to Ontario. The Liberals have been making gains in British Columbia and the Prairies during this campaign, but the bulk of their increase has come from Ontario — and most of that from the Conservatives. The Liberals currently lead in the province with 37 per cent, a gain of almost nine percentage points since the campaign's kickoff. The Conservatives have been consistently dropping in Ontario, falling five points to 30 per cent. The NDP has seen less movement overall (though it has gone through ups and downs in the polls), down just under four points to 27 per cent. The New Democrats still lead in British Columbia, but have dropped almost five points there to fall to 36 per cent. The Liberals are running second with 29 per cent, a gain of six points, while the Conservatives have dropped four points to 24 per cent. The Greens are polling at their best in this region, up 3.5 points since the start of the campaign to 11 per cent. The NDP has also seen weaker numbers in Alberta and the Prairies, benefiting the Conservatives in the former and the Liberals in the latter. But making up for these losses in the West has been an NDP surge in Quebec. The party started the campaign in good form in the province, and has since seen its support there balloon by nine points to 45 per cent. The Liberals follow with 21 per cent, down two points, while the Bloc Québécois is floundering with 16 per cent support (down three points). The Conservatives are in fourth in the province with 14 per cent. These regional shifts show how fluid the race continues to be. On the whole, the Conservatives are down and the Liberals are up, with the NDP holding steady. But the Liberals are down in Quebec while the Conservatives are up in Alberta, and the NDP is gaining in Quebec while dropping in the West. These shifts all have serious implications in the seat count: further gains by the NDP in Quebec and the Conservatives in Alberta do little to improve their seat totals when they already dominate these provinces. Incremental gains in Ontario and British Columbia, where there are more seats at play, pay greater dividends. And for now, that is where the Liberals are improving their position. The poll numbers in this campaign will continue to go up and down between now and Oct. 19. But the second phase, despite some movement in the preceding weeks, starts with no clearer indication than there was on Aug. 2 of who will prevail.